Breakthrough technology and integrity in the extraction process allow for a never-before-seen quality in the marketplace. PALM BEACH GARDENS, Fla., Sept. 20, 2018 /PRNewswire/ -- Garden of Life, the leader and innovator in nutritional products, partnered with actress, best-selling author and health advocate, Alicia Silverstone, to co-create the only full-range line of herbal supplements that are Certified USDA Organic, Non-GMO Project Verified, and Certified both Gluten Free and Vegan: mykind Organics Herbals. Now available on shelves at local health food stores nationwide and on Amazon, mykind Organics Herbals is USDA Organic and Non-GMO Project Verified – their gift of health to you. Alicia collaborated with Garden of Life five years ago to develop mykind Organics' core product, as she wanted a vitamin supplement that didn't exist – one that came from the same organic, nutritious foods she eats daily. She went looking for a partner and found Garden of Life. Silverstone and Garden of Life put their hearts and minds together to produce this amazing line of mykind Organics vitamins and now this new line of mykind Organics Herbals. In a world where it's hard to know where exactly the ingredients of our products are coming from, mykind Organics Herbals brings health conscious customers peace of mind with supplements that are created without harsh toxic pesticides, herbicides or fungicides and thanks to their breakthrough extraction method, a high-quality process that ensures desired potency in each unique formula. "Our herbals are special because we source ingredients from sustainable organic farms and use an organic, non-GMO extraction method without the use of conventional corn alcohol or other harsh chemicals," said Alicia Silverstone. "The quality of the ingredients and the integrity of the process makes me really proud to share these with my family and with you." The mykind Organics Herbals line includes 16 supplements in a variety of forms like tablets, powders, sprays, liquids and gummies. The suite of products includes: Turmeric Pain Relief, Maximum Strength Turmeric Joints and Mobility, 2 month and 4 month supply of Extra Strength Turmeric Inflammatory Response, Fermented Organic Turmeric Boost Inflammatory Response, Turmeric Inflammatory Response Gummy, Golden Milk Powder Recovery & Nourishment, Adrenal Daily Balance, Ashwagandha Stress & Mood, Elderberry Immune Syrup, Elderberry Immune Gummy, Liver Bitters Detox Spray, Sleep Well Rest & Refresh, Sleep Well R&R Spray, Fair Trade Organic Maca Root, Prostate Herbal Support, and Oil of Oregano Seasonal Drops. Garden of Life, L.L.C. is the recognized leader and innovator in whole-food, science- based, USDA Organic and Non-GMO Project Verified nutrition. Headquartered in Palm Beach Gardens, Fla., the company offers more than 330 branded supplements that help people achieve extraordinary health. For more information on Garden of Life, visit gardenoflife.com. 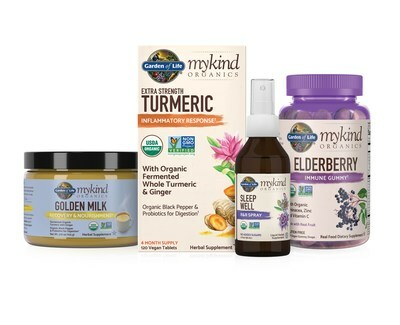 The mykind Organics Herbals line will be available in stores across the country. To locate a store, visit gardenoflife.com. Co-Creator Alicia Silverstone teamed up with Garden of Life, L.L.C. to create vitamins made from organic, nutritious foods. Their shared vision of bringing the highest-quality vitamins to families everywhere led to a scientific breakthrough that created an entirely new Certified USDA Organic, Non-GMO Project Verified line of multivitamins made from real, whole foods—fully traceable back to the seed and organic farm they were grown on. Alicia Silverstone, most recently starred in the lead role of Paramount Network's successful American Woman, is likely best known for her generation-defining turn in Clueless. Through film, television and theater, her performances have garnered award and critical praise including Emmy and Golden Globe nominations as well as a National Board of Review award. A dynamic and well-connected fixture in the acting, political, and scientific communities, Silverstone is also a dedicated activist in the health and wellness space. Silverstone chronicled her own journey toward a more conscious way of eating in her first book, New York Times bestseller, "The Kind Diet: A Simple Guide to Feeling Great, Losing Weight, and Saving the Planet." Her second book, "The Kind Mama: A Simple Guide to Supercharged Fertility, a Radiant Pregnancy, a Sweeter Birth, and a Healthier, More Beautiful Beginning," was released in 2014. Silverstone co-created the mykind Organics vitamin line, which is the first ever food- based, organic, non-GMO vegan vitamin.